Vitamin B12 deficiency test: diagnosing vitamin B12 deficiency. What tests are available? Which are best? Who can conduct them? How can you test for vitamin B12 deficiency? Which tests are most worthwhile? Are vitamin B12 urine tests possible? What do various values mean? Should you take B12 supplements before a test? Maintaining a sufficient supply of vitamin B12 is essential for good health, as the multiple benefits of the vitamin effect many different areas of the body. Therefore, it makes sense that if someone is displaying typical symptoms of vitamin B12 deficiency or has an increased likelihood of developing it – e.g. vegans, vegetarians and the elderly – they measure their B12 level using a vitamin B12 test. In this way, if deficiency is discovered, steps can be taken to quickly remedy it. Unfortunately, however, measuring the B12 level in the body is not quite as simple as one might hope. People who decide to get themselves tested will soon discover that there is neither a clear definition for deficiency, nor a consensus on a general, standardised test. At present, the best and most reliable tests for vitamin B12 are the holo TC and MMA urine tests. So which tests are worth doing? And how is vitamin B12 deficiency actually defined? Which Vitamin B12 Tests are Available? No tests are yet able to give clear information about B12 levels. Presently, a number of tests are in use, all of which have certain advantages and disadvantages. The standard test in general medicine is the serum test, which is the oldest but by far most unreliable B12 test of all. Holo TC Bioavailable B12 which binds with transcobalamin in the blood High. However with a grey area, in which the diagnosis is uncertain. Homocysteine Homocysteine levels in the blood Medium. Numerous other factors could also play a role. MMA Methylmalonic acid levels in the urine High. Only a handful of other factors. As this table clearly shows, holoTC is the most exact test and the first to detect the beginnings of an undersupply. MMA urine tests are likewise very sensitive and the easiest method of discovering an existing cellular deficiency. Nowadays, both tests can be conducted at home through self-test kits. Is it Necessary to Stop Taking Supplements Before a Test? Many people ask if the intake of B12 supplements should be suspended before a test, and to what extent they might distort the results. The answer to this question depends on the desired information. Following B12 injections as part of an initial therapy to replenish the body’s store of the vitamin, a waiting time of 10-14 days is required before a B12 test is conducted, otherwise results will be significantly distorted. After a B12 injection, a blood test is almost meaningless, since only the vitamin B12 circulating the body as a result of the injection will be measured. However, in order to check the effectiveness of a smaller, permanent maintenance dosage of B12, testing whilst taking supplements can provide valuable insight. In the following, the individual tests will be described in detail. At present, vitamin B12 deficiency is most often measured via a serum test and defined as a B12 serum level under 200 pg/mol. This value does not however describe the actual supply of vitamin B12 within the blood cells, since not all of the vitamin dissolved in blood can be used by the body. The sole decisive factor is the actual supply of B12 within the cells, which cannot be accurately measured through a serum test. The values given through a serum blood test are of little informative use and this method is the most unreliable of all possible tests. Despite its unreliability, the serum test is always used to determine a B12 deficiency. The below table illustrates the definition of deficiency which is still followed today. Among vitamin B12 researchers, these values – which are used in general medicine – are considered very unreliable. Other tests with different methods have shown that a deficiency can exist even with very high B12 serum levels (1-4). Some researchers – such as B12 experts Mitsuyama and Kogoh (5), Tiggelen (6) and David Brownstein (7) – are convinced that, even from a value of 600 pg/mL, the cells can suffer from an undersupply of vitamin B12; the number of deficiency sufferers is thus significantly higher than officially given. Numerous studies agree that even with B12 serum levels far higher than the perceived norm, distinct vitamin B12 deficiency symptoms can still manifest. The serum test is the oldest of all tests, even so it is still used to provide the current definition of a B12 deficiency. Furthermore, most doctors are unaware that superior measurement methods even exist. The serum test is not worthwhile, since a large majority (70-90%) of the vitamin B12 measured is bonded to proteins like haptocorrin – meaning that it cannot be used in the metabolism. Additionally, the test also measures completely inactive B12 analogues: these are substances, which are chemically very similar to the vitamin, but have absolutely no positive effects in the body. The only vitamin B12 in the blood that is useful to the body is the cobalamin (B12) that is bonded to transcobalamin II, which equates to around 20% of all B12 measured in the blood serum. This demonstrates that the overall levels of B12 in the blood are of little relevance to the amount of the vitamin that the body can actually utilise. What is more, a deficiency can exist even with very high B12 serum levels. The level of the holo TC can also be determined in the bloodstream – this is the amount of biologically available B12 bonded to transcobalamin II. A lower level of holoTC in the blood is considered the first indicator of a B12 deficiency; an early warning that the body isn’t receiving enough usable B12 and that the body’s store of the vitamin is beginning to empty. The results of a holoTC test are thus much more useful than those of the serum test, even though it cannot say for certain that there is a B12 deficiency present, as there remains a large grey area in which it is unclear whether or not a deficiency exists. Additional factors in the complete blood count can bring more clarity here. The holoTC test is now available as an over-the-counter test kit and can be performed at home. There is a large grey area when it comes to serum tests. The same can be said for holoTC test, which however always indicates either a latent or new deficiency. Usual evaluation of serum and holoTC tests. The values for the serum test are quite controversial and are considered too low by many researchers. The doctor David Brownstein, for example, claims that a shortage of total vitamin B12 begins with a level of less than 600 ng / l.
When B12 deficiency is present, homocysteine levels rise significantly. Higher homocysteine levels can be considered a definite indicator that deficiency exists. However, certain diseases and other nutrient deficiencies can distort the results. Even so, a combination of tests – such as the holoTC test and the homocysteine test – can give very reliable results. The homocysteine test is also commonly used to test the success of B12 therapy. The homocysteine level should ideally be under 9 μmol/l. Presently, the simplest way to detect a vitamin B12 deficiency is the methylmalonic acid (MMA) test. When there is a deficiency of biologically active B12 in the cells, an increasing amount of MMA is formed, which can be measured in both the blood and urine. An advantage of measuring MMA is that it can determine very early on whether there is enough active B12 in the cells. A further advantage is the fact that this can be determined through a simple urine sample; making a blood test irrelevant. The MMA level is tested relative to the creatine level in the body, in order to remove the water content of the urine as a distortion factor. Other than a few, very rare diseases, there are hardly any factors which disturb the results of the MMA test, making it the best quick test available today. The ideal test would be a combination of the holoTC, homocysteine and MMA tests, but all three are a significant expenditure. This is why the MMA test is most commonly recommended, as it typically costs between $50-100 (£40-75). Furthermore, many companies offer MMA tests which can be carried out at home. Researchers at the University of Florida have developed a breath test which determines the level of B12 through the CO2 content in the breath. B12 plays a decisive role in the metabolisation of the sodium propionate into CO2. Through administering sodium propionate and measuring the subsequent levels of exhaled CO2, it is possible to ascertain the body’s B12 status. For this purpose, the carbon in the sodium propionate is marked by a carbon isotope in order to be able to distinguish between the CO2 from the sodium propionate and that which is naturally exhaled. The test is currently still in the research phase, but has already proven itself to be reliable. In years to come it could be a comfortable alternative to the existing tests. Who can Perform a Vitamin B12 Test? Serum tests and homocysteine tests can presently only be carried out by a GP. They require a blood sample taken on an empty stomach. Holo TC and MMA urine tests can be ordered from various companies online and must be completed and returned, before results are sent out either by email or post. We recommend that individuals who believe they suffer from B12 deficiency initially conduct the most affordable and comfortable variant: the MMA test. This gives a clear indication as to whether a deficiency is present. If the test is positive, a follow up appointment with a doctor should be arranged in order to find out the cause of deficiency and to discuss treatment. Those who would rather not visit the doctor or who believe that their potential deficiency could be caused by an insufficient intake of B12 – for example vegans and vegetarians – can simply start to take regular doses of B12 supplements and then complete a second MMA test after a few weeks. If this second test returns positive for deficiency, then it is highly likely that the cause of the problem is absorption difficulties. At this point in time, we highly recommended seeing a doctor. In the case of certain diseases, the body falsely produces antibodies that attack the intrinsic factor, as part of an autoimmune response. As a result, B12 cannot be absorbed. Through a relevant test, these antibodies can be detected. Traditionally, the Schilling test determined whether the body can absorb B12 via the intrinsic factor, a special transport protein. The patient is administered radioactive labelled vitamin B12 and the absorption is controlled. The first time, just B12 is administered; the second time a combination of B12 and the intrinsic factor. If the patient is unable to absorb the B12 alone, but succeeds with the intrinsic factor, then the cause of the absorption difficulty can be pinpointed. If absorption fails in both cases, another cause is responsible. The Schilling test is hardly practiced today because IF antibody testing is much easier, although it does not detect all cases of IF disorders. 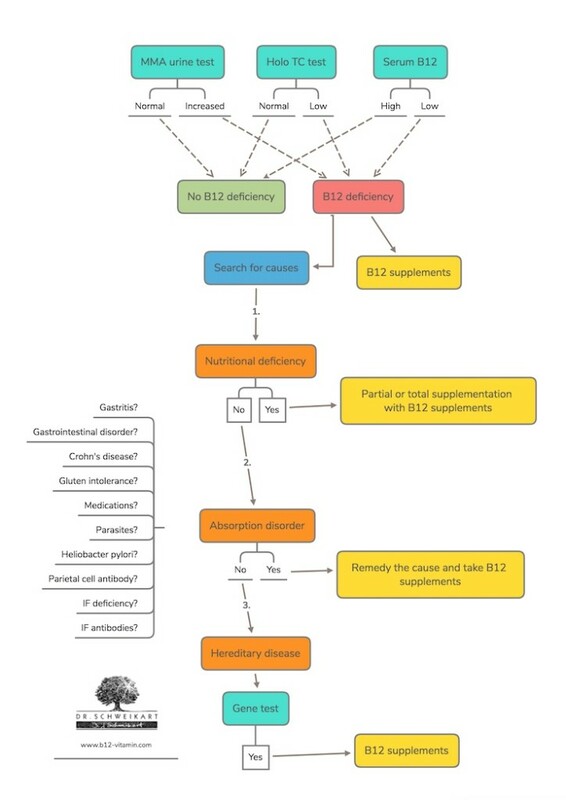 The following graphic schematically illustrates how testing for B12 deficiency takes place. In the interest of clarity, further test methods for individual causes are not included.